Can you believe I've been to a whopping 16 comic book and popular culture conventions this year?! Big and small, they've all been terrific for the most part. Well except September's Long Beach Comic Con which was a frigging mess. Comikaze looms at the end of the month but before then we'll be headed to downtown for a show I never knew existed, the western and Magnificent Seven themed M7 Con! I don't know how I missed this for the last two years as The Magnificent Seven movie and TV show are among my favorites of either media. I remember the first time I saw M7 the film was on AMC back when they still showed movies, fell in love with it then bought it on VHS and subsequent special edition DVD. Based on Akira Kurasowa's seminal film The Seven Samurai, the story of a band of ragtag samurais protecting a small village in Japan, Magnificent transplants the action to Mexico where veterans and gunfighters band together to take on a bandit and his small army. Directed by Damamged Goods Hall of Famer John Sturges with a script credited to William Roberts, Seven starred Yul Brynner as black clad leader Chris Adams while launching the careers of Steve McQueen, Charles Bronson, James Coburn and Robert Vaughn. Released in 1960, the film made little impact in America but made a splash in Europe and returned to become an audience favorite that garnered an Academy Award nomination for composer Elmer Bernstein's rousing score. John Sturges had steadily been building his reputation as the go-to filmmaker for action flicks with heart and machismo with Escape from Fort Bravo, Bad Day at Black Rock and Gunfight at the O.K. Corral already to his credit. Seven would cement his status as an action director who specialized in alpha, doer-centric casts and would culminate in career high effort The Great Escape in 1963. Allegedly The Magnificent Seven is the second most played film on television. Yul Brynner lead sequel Return of the Seven was released in 1966 featuring an all new cast that included Robert Fuller and Warren Oates. Burt Kennedy (Support Your Local Sheriff!) directed the Larry Cohen scripted affair which reused Bernstein's memorable score. George Kennedy assumed the role of Chris Adams with Bernie Casey and Joe Don Baker appearing in 1969's Guns of the Magnificent Seven before 1972's The Magnificent Seven Ride! recruited Lee Van Cleef as Chris for the film franchises final ride. An update was bandied about in the 80's from Hard Times and The Warriors' Walter Hill then the 90's with Star Wars: The Empire Strikes Back and Raiders of the Lost Ark writer Lawrence Kasdan at the helm but those versions never materialized. 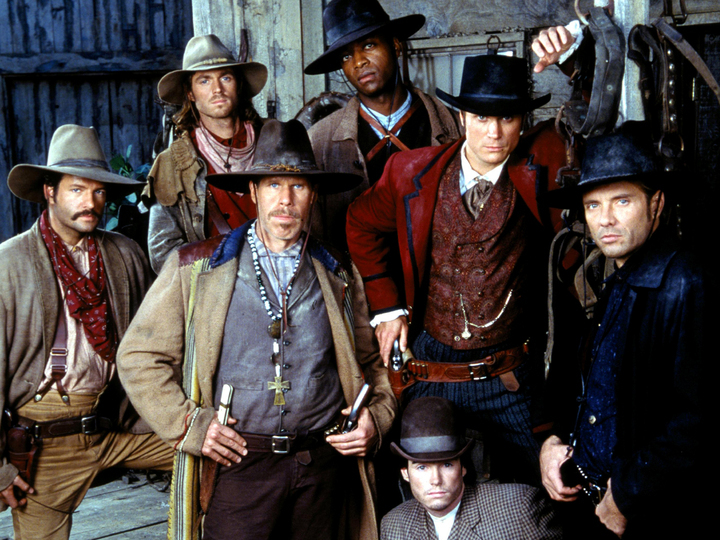 Cut to January of 1998 and CBS premiered The Magnificent Seven starring Michael Biehn, Eric Close, Ron Perlman, Anthony Starke, Rick Worthy, Dale Midkiff and Andrew Kavovit. The pilot found the new seven taking on a band of disgruntled Confederate soldiers headed by Robocop's Kurtwood Smith as he threatens a village of natives and freed slaves. Young Guns and Under Siege sequels director Geoff Murphy takes the reins for an action packed if unevenly shot 90 minutes which manages to fit in some social commentary about race relations, belief and honor back in the old west from a script by Frank Q. Dobbs, Chris Black, Pen Densham and John Watson. Of course Biehn's involvement got me hooked early on but the cast all get their time to shine. Biehn plays black clad leader Chris who is known as a cold blooded killer throughout the territory after losing his wife and son. Eric Close fills in for Steve McQueen as 2nd in command sharp shooter Vin while Perlman is Josiah, the preacher who drinks and fights, Starke is the card shuffling scoundrel Ezra, Worthy plays Nathan the stretcher bearer turned town doctor, Midkiff as ladies man Buck and Kavovit as young whipper snapper J.D. Debuting on Saturday, January 3rd in place of Doctor Quinn, Medicine Woman, The Magnificent Seven pilot came out guns blazing, securing the # 8 spot for the week with 10 million viewers and 19% share of monitored viewers. I remember sitting in a movie theater on a Friday night and suddenly realizing I had forgotten to set the VCR to record an episode. I contemplated using the pay phone to tell my mom to do it for me but luckily the entire series would be released on DVD in the mid 2000's.